This was Dan’s first game, but having played Dan for years in Malifaux I’ve learned never to underestimate how quickly he learns a new ruleset or faction. This game was a great example of that. He knew what he was doing from the start and played a tight and tactical game. This was a very bloody six-turn game, with only four models surviving. I was taking break tests from turn three and that was the deciding factor. I managed to outscore Dan (just) on VPs, but my Kill Team broke with the last role of the game and unfortunately that roll isn’t one you’re allowed to re-roll. Fantastically close and hard fought game. I wish I could say this game was as close… we decided to play Assassinate to give me a chance to take out the pesky Grey Knight leader who survived Game 1. It wasn’t to be, however. Again the Genestealers stormed towards the Knights, but they couldn’t quite get to the leader. Dan, in a moment of inspired insane bravery charged a Genestealer with his leader as I threatened to break through. This proved decisive and the stealers couldn’t get close to him again. I really like this mission. The points are scored at the end of every turn, making for a tense and tactical game. There are five objectives. A player scores VPs for controlling the objectives, but the points scored are: 1 VP for the objectives closest to your deployment, 3 VPs for the single objective in the middle and 2 VPs for the objectives near your opponent’s deployment zone. Dan managed to eek out another victory in a very close and tense game. I pulled out an early lead on VPs by rushing him with the Genestealers, but I couldn’t quite hold on. Dan won 13 to 12. If I had just managed to prevent a Neophyte from becoming shaken* (no CPs!) I could have won that game. So… three great and fun games. I’m looking forward to more Kill Team. I might shake up my Kill Team a little before I play Dan’s Grey Knights again. 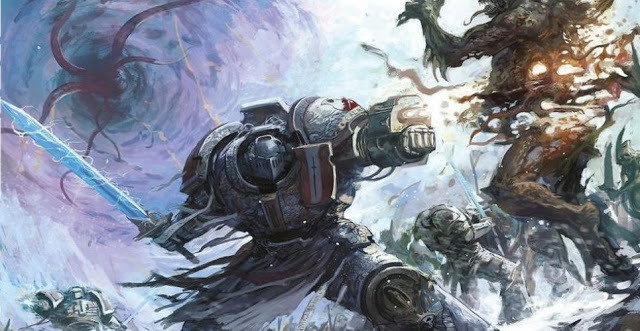 Let’s see how they deal with even more Genestealers!! Sounds like some good games. No surprise Dan was fully prepared, he gives no quarter. Oh yeah, fighting Tau would be fun. I’m thinking of doing Harlequins. They’d be interesting to paint (although maybe they’d play a little like Genestealers).